When you are in the Compass mode, you see two moving segments on the rim of the display. These point towards North. The hairline at 12 o’clock shows your heading and functions as a compass direction arrow. The numerical value of your heading is shown in the center of the display. The compass will switch itself to power saving mode after a minute if no buttons are pressed. Reactivate it with Start Stop. You can use the compass in two ways: you can use the bezel or the bearing tracking. 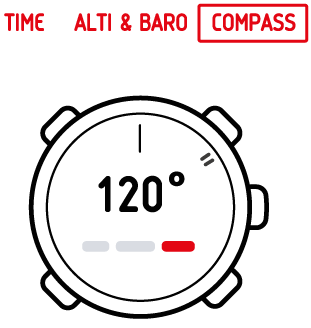 In bearing tracking you can lock a bearing (direction) and your Suunto Essential compass will guide you along it. Point the compass direction arrow in the direction you want to travel and press Start Stop. The bearing is now locked. Your current heading is shown in the middle of the display, and it will change according to your movements. The arrows in the top row of the display point you in the direction you need to take in order to keep to your desired bearing. The symbol confirms that you are aiming towards the right direction. Pressing - Light also activates the backlight. You’re hiking and you’ve just climbed a steep hill. Looking out over the valley below, you see a cabin on another hill. You decide to hike to the cabin through the valley. You point the direction arrow of your compass towards the cabin and lock the bearing. Once you’re in the valley, the arrows in the display’s top row show you where to go. Because the compass is active for only 40 seconds at a time to conserve battery life, now and then you need to re-start the compass to check your heading. Keep an eye on it and you’ll get there soon.